I recently bought a duo palette from MAC as well as a 24 room pan for my single palette. So today I cleaned up the single palette, depotted the eyeshadows I had in it, cleaned those and put them into my duo palette where I am going to use the other side for blushes very soon. I put in the 24 pan in the single palette and startet shaping my lipstick into the pan. I have seen different tutorials on how to place your lipsticks into the pan, most of them where you melt your lipstick into the pan for the perfect shape. I, however, am too scared to change the lipsticks color and texture, which can easily happen, if you heat the lipstick just a tad too much. So I decided to press the lipsticks on a spoon so it became mushy and then I placed the lipstick into the pan. It might not be the prettiest result, but my lipsticks are still intact and I only used around 1/4 of the lipstick in each room! 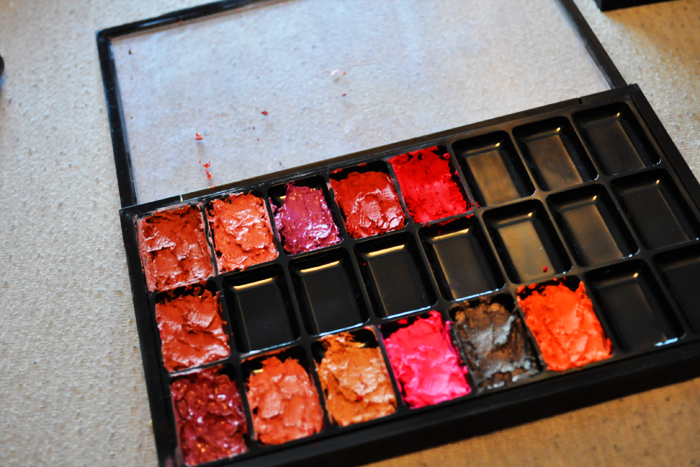 This is just a little preview of the palette, I still have to fill out the rest of the pan! This is a great way to have your lipsticks stored, I am going to put the names of individual lipstick shades on the back of the palette too, so I can keep track of that. I find that applying my lipstick with a brush is 10 times easier that applying the directly from the stick and you don't use as much lipstick at a time either. I also found, when I cut the lipsticks that I did not have much product left in, that there is about 1/4 more lipstick at the bottom, which you usually can't get off when you just leave it as a stick. So if you wear down a lipstick, you can always scoop out the reaming product and put it in one of these palettes, that's what I did with my Taupe and Angel (the two first colors on the top left to right) , which I had almost nothing left of! I still have to clean the palette after I get the rest of the lipsticks into the pan, and even the lipsticks out a bit more. But I can definitely recommend this to anybody! 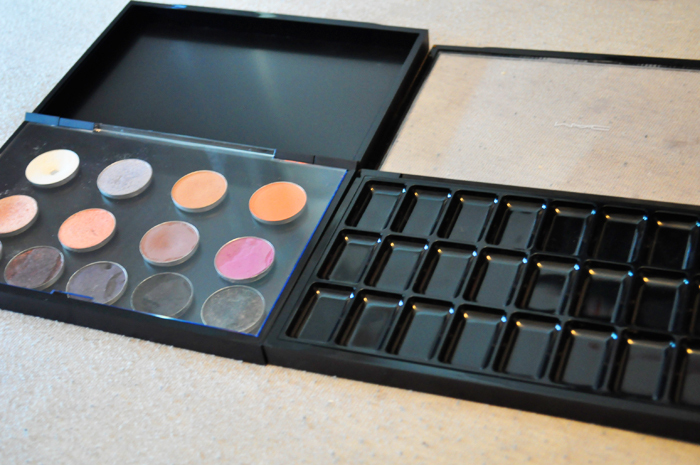 It is also easy for me to bring one of these palettes with me on jobs, instead of bringing all my lipsticks. Hope you are enjoying your Sunday, everybody!